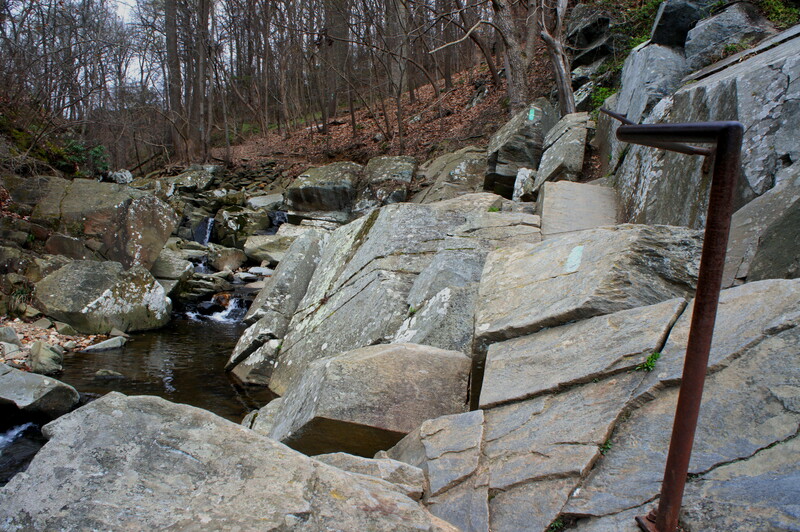 Terminating at a multi-tiered waterfall, the Gulf Branch Trail follows one of northern Virginia’s several lush stream valleys from Glebe Road Park in Arlington to the Potomac River. The Gulf Branch Nature Center, situated roughly halfway through the hike, offers daily programs and surprisingly extensive exhibits on the local ecology and history. The below account traces a 2.2-mile stem-and-loop, beginning and ending at Glebe Road Park. Most visitors come to Glebe Road Park—situated off N. Old Glebe Road in North Arlington—for its playground or tennis and basketball courts. That makes skirting the right flank of the basketball court slightly awkward before disappearing down a grassy slope and into the woods. After about 150 yards, look for a wooden bridge and a sign marking the entrance to Gulf Branch Natural Area. 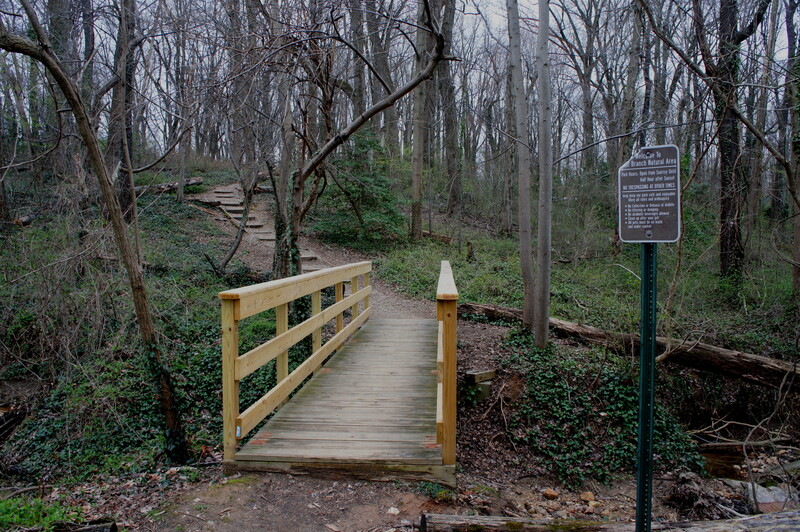 Cross the bridge and ascend a series of 14 steps, cresting a wooded hill. The Gulf Branch Trail quickly drops down from its heights, crosses a small ravine, then traverses a graveled road. Stay straight, bearing downhill on the gnarled path as it approaches Gulf Branch for the first time. 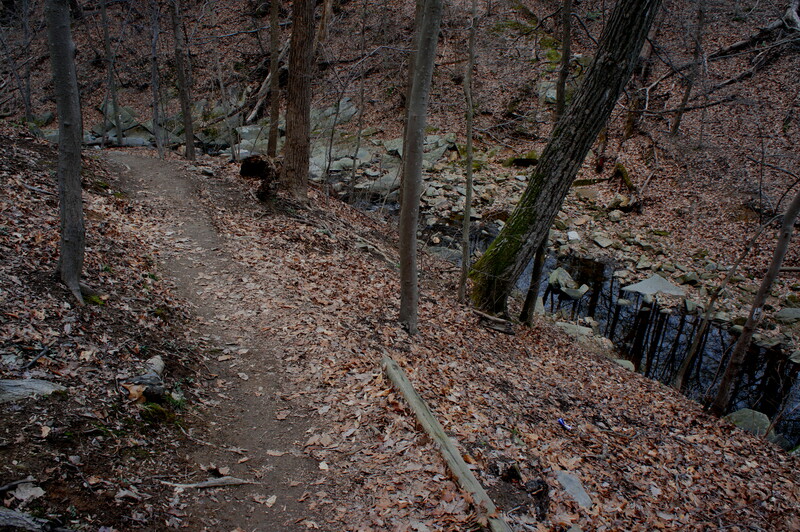 Minutes later, stay left at the trail fork, passing the reddish bridge on the right. 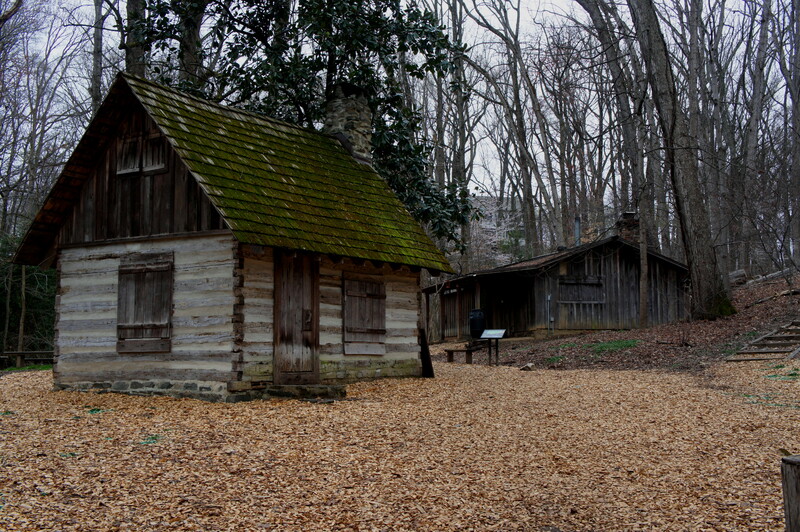 Ahead, the first of several manmade structures appears, the Gulf Branch Forge—an old blacksmith shop. Next up is the Robert Walker Log House on the right, a reconstruction made of timbers from the original structure built in 1871. 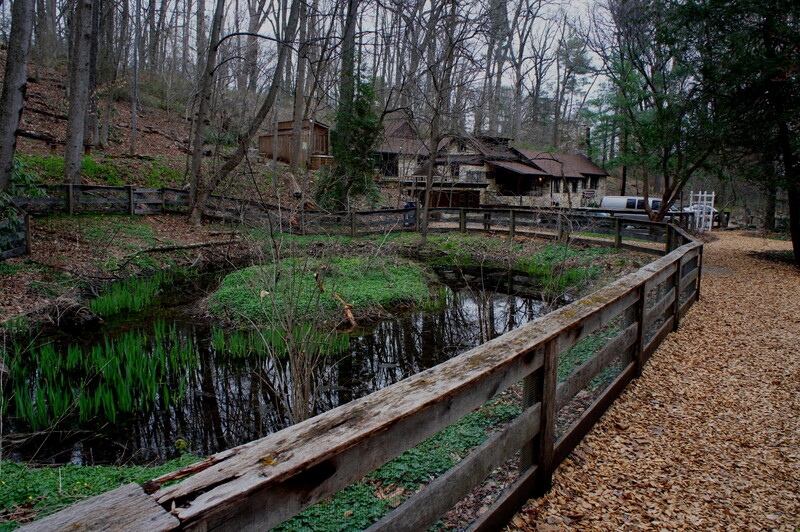 A wooden enclosure surrounds the Gulf Branch Pond on the left; at the end of the pond lies the parking area for Gulf Branch Nature Center. 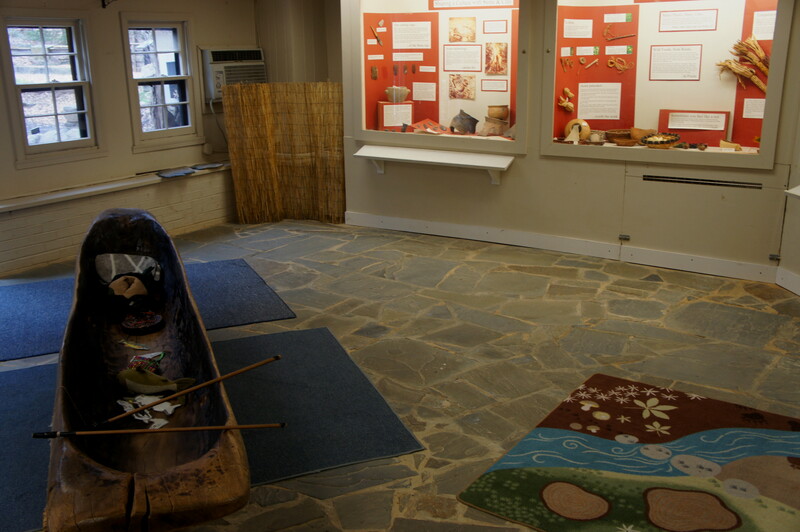 Inside the stone-lined building, it’s worth exploring the upstairs and downstairs exhibits. Here you can find snakes, turtles, and other critters, the star cast of several educational programs at the center. Back outside, cross the parking lot and follow the briefly paved path to another wooden bridge over Gulf Branch. 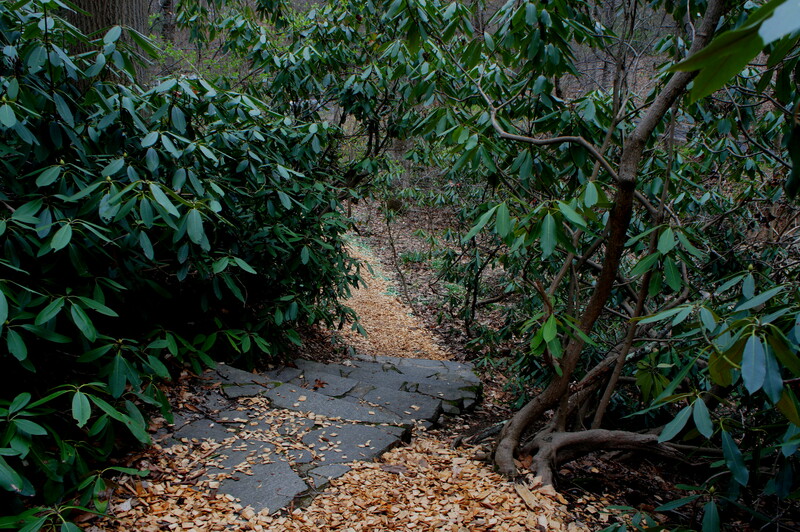 On the other side, a well-manicured trail bears left and ascends through a thick rhododendron grove. Follow the path up to the Military Road and continue to the other side. Keeping the pumping station on the right, the graveled trail follows Gulf Branch downstream. Staying a good 10-20 feet above the creek, the Gulf Branch route crosses a brush-clogged tributary, then eventually drops down a set of stone steps to creek level. Cross a second tributary, then Gulf Branch itself. Emerging on the left bank, bear right at the trail junction. 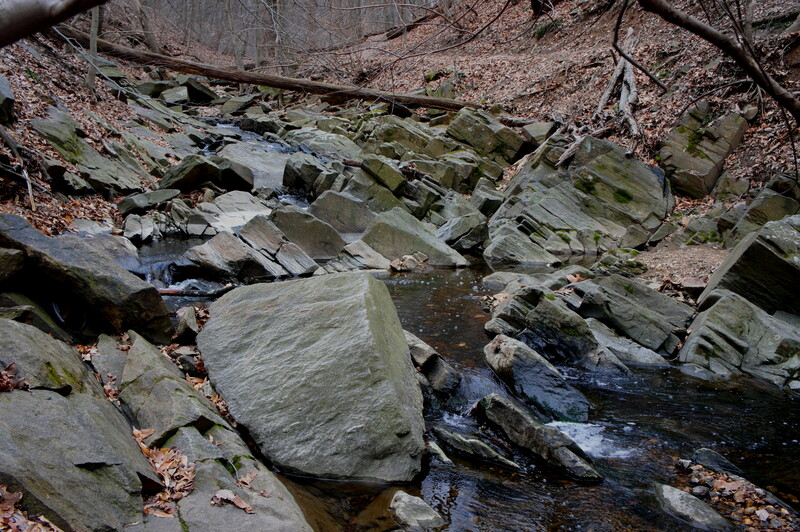 Some 300 yards downstream, the stream below narrows, squeezing through a set of minor cascades. 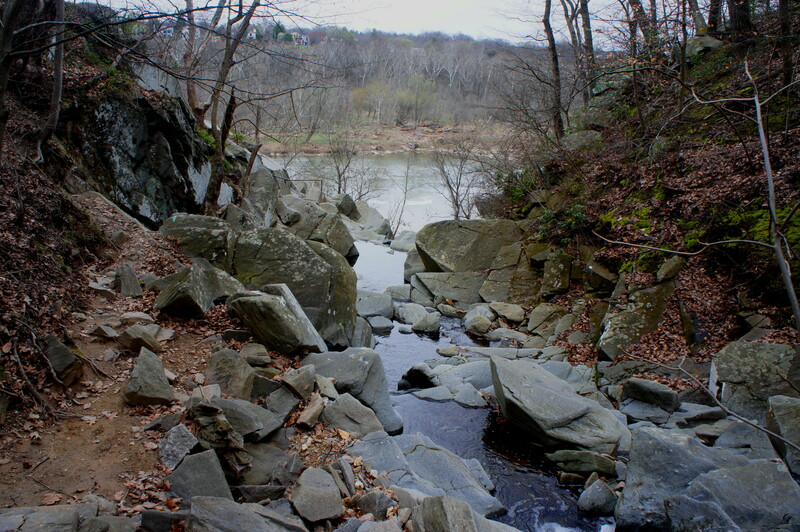 Greywacke sedimentary rock forms the bedrock as the George Washington Memorial Parkway appears ahead and the route crosses Gulf Branch a third time. Stay straight as a spur trail climbs the hillside on the right. 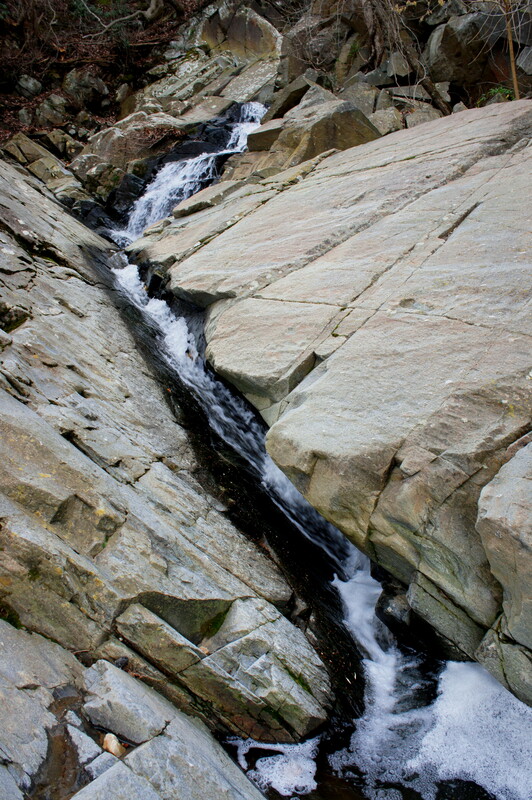 With Gulf Branch on the right, aqua blazes guide hikers up and over a jigsaw of blocky stones, an often-intimidating traverse edging the left bank of the creek. Railings on the left assist with the tricky venture. 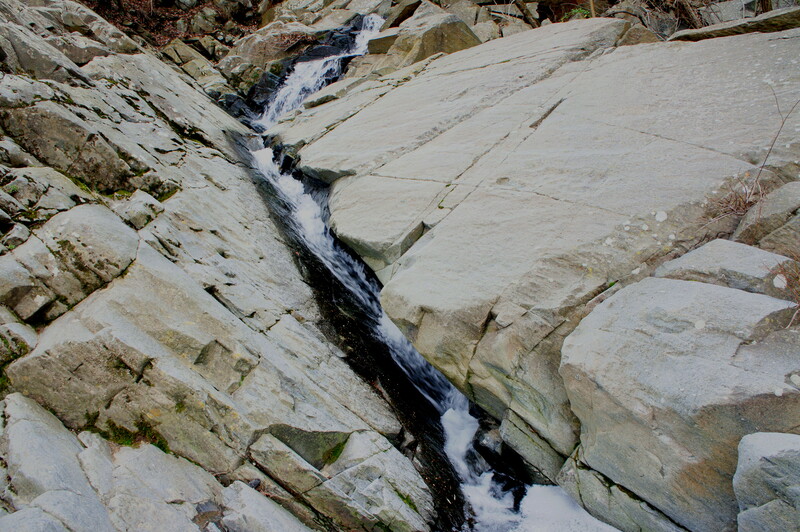 At the brim of Gulf Branch Falls, the route bears left then drops abruptly down a 30-foot fissure. 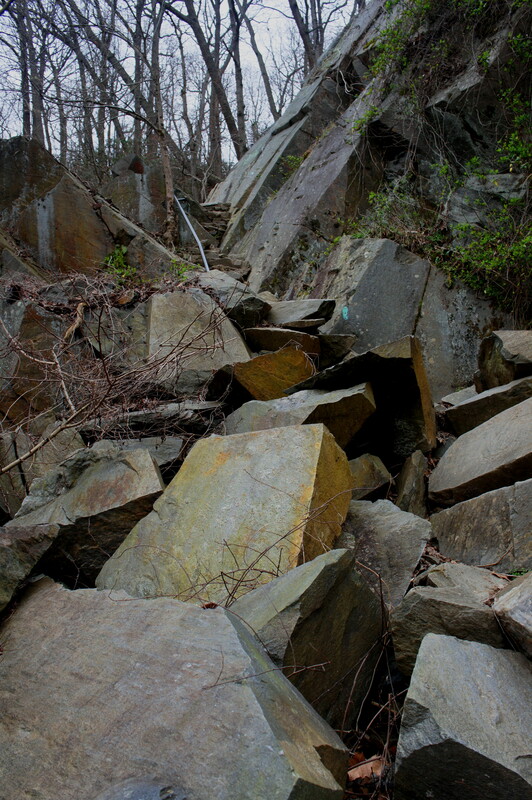 Here the boulders are as big as ever, a neat geological treasure within striking distance of the nation’s capital. Bear right at the end of descent, with the Potomac River just steps away. 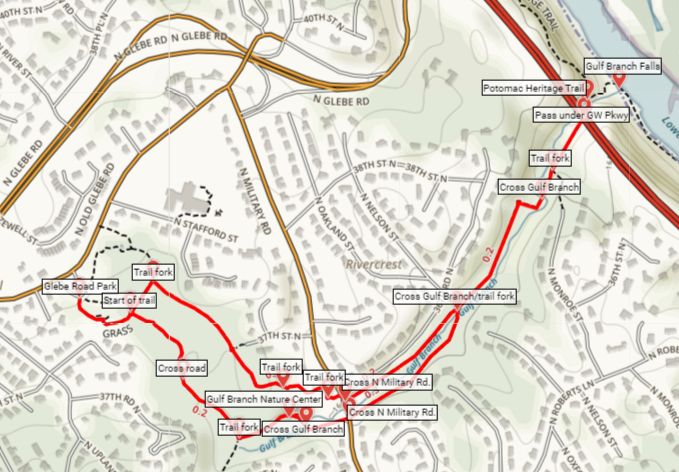 As the hike described here is a lasso, or stem-and-loop, it requires doubling back for around ½ mile, retracing the strenuous bypass of Gulf Branch Falls and two creek crossings. The hike embarks on new ground again at around 1.5 miles; stay straight at the trail junction, continuing to follow the left bank all the way back to Military Road. Cross the street and saunter down the approach road to Gulf Branch Nature Center for 30-40 yards; look for a trail climbing up the hillside to the right. Follow this trail as it crests the wooded knoll and meanders north-by-northwest. Stay right at the next trail junction, eventually emerging from the woods and onto a green field. (Note: This is technically part of Fort Ethan Allen Park but, with houses looming large on the right, feels an awful lot like wandering through a large backyard.) 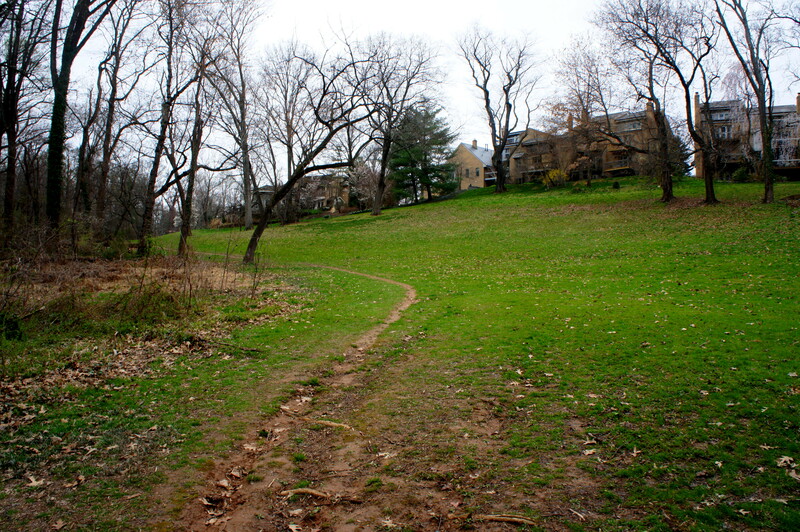 Follow the obvious path until it forks, bearing left as Glebe Road Park reemerges. Climb the hill back to the parking area. 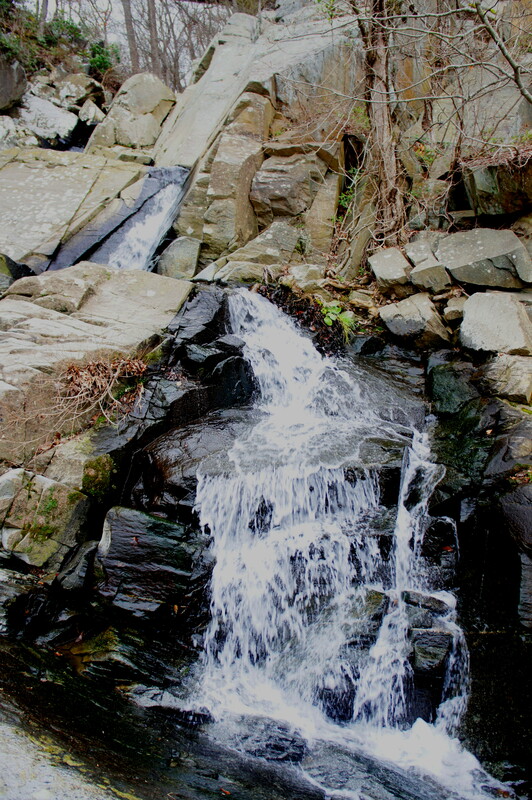 While only 2.2 miles round-trip, hikers should allot at least 1.5 hours for this circuit hike, on account of the steep climb and interesting scenery at Gulf Branch Falls. 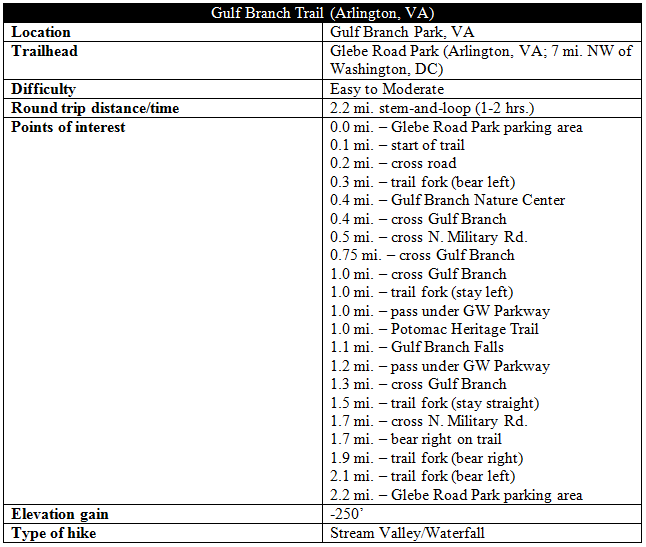 This entry was posted in Arlington County Parks, George Washington Memorial Parkway, Moderate Hikes, Virginia and tagged Arlington, George Washington Memorial Parkway, Glebe Road Park, Gulf Branch, Gulf Branch Falls, Gulf Branch Natural Area, Gulf Branch Nature Center, GW Parkway, loop hike, Potomac Heritage Trail, Potomac River, stream valley, Virginia, waterfall. Bookmark the permalink. Thanks for posting this! I hiked the PHT a few years ago and this was my favorite waterfall on the hike. 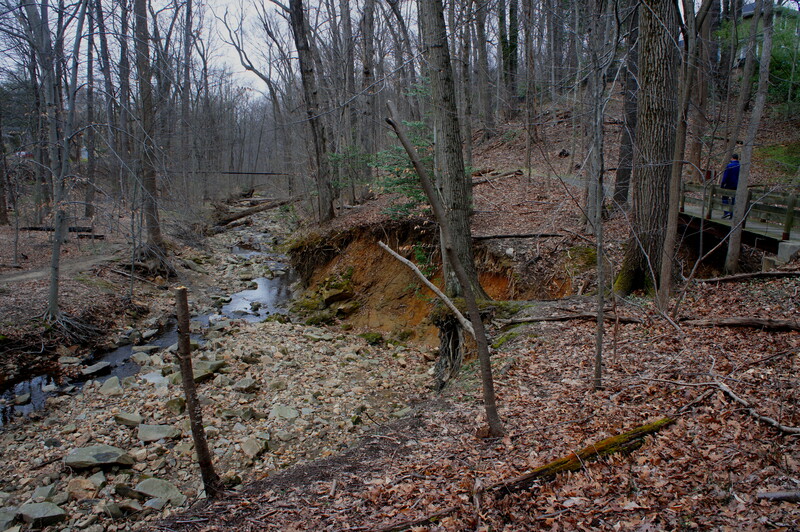 But, I couldn’t remember the name and have searched down some of the other streams (like Donaldson Run) looking for it. Wasn’t until I saw your post that I knew this was the one!